Summer’s here, and you know what that means! Flee indoors and play games until the fiery sky-ball no longer burns our skin with its cruel flames. Seriously though, there’s enough great stuff in Kobold Quarterly #22 to keep you occupied all summer. Get it in print + PDF or PDF only and you’ll enjoy articles for Pathfinder Roleplaying Game, 4th Edition D&D and AGE System. But wait, there’s more: we also have articles for Castles & Crusades and 13th Age! Old school, new school, and everything in between — this issue’s got it. 10’x 10′ Toon by Stan! 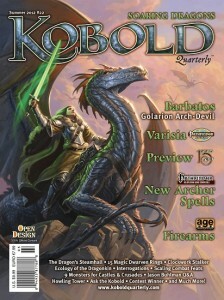 Pick up Kobold Quarterly #22 today! What’s this you say? 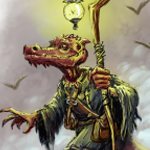 Castles and Crusades content in Kobold Quarterly? Well, color me thrilled. I’ll be buying my first issue…..right……now!